The Akkadian Empire was an empire centered in the city of Akkad Sumerian: Agade Hittite KUR A.GA.DEKI "land of Akkad". ; Biblical Accad) and its surrounding region Akkadian URU Akkad KI in central Mesopotamia. The city of Akkad was situated on the west bank of the Euphrates, between Sippar and Kish (in Iraq, about 50 km (31 mi) southwest of the center of Baghdad). Despite an extensive search, the precise site has never been found. It reached the height of its power between the 24th and 22nd centuries BC, following the conquests of king Sargon of Akkad. Because of the policies of the Akkadian Empire toward linguistic assimilation, Akkad also gave its name to the predominant Semitic dialect: the Akkadian language, reflecting use of akkadu ("in the language of Akkad") in the Old Babylonian period to denote the Semitic version of a Sumerian text. The akkadians were very skilled. Many were used as assassins. The form Agade is Sumerian - appearing, for example, in the Sumerian King List; the later Assyro-Babylonian form Akkadu ("of or belonging to Akkad") was likely derived from this. It is possible that the Sumerian name, despite its unetymological spelling A.GA.DE, is from AGA.DE, meaning "Crown of Fire" in allusion to Ishtar, "the brilliant goddess", whose cult was observed from very early times in Agade. Centuries later, the neo-Babylonian king Nabonidus mentioned in his archaeological records that Ishtar worship in Agade was later superseded by that of the goddess Anunit, whose shrine was at Sippar - suggesting proximity of Sippar and Agade. (There were actually two cities named Sippar - one under the protection of Shamash, the sun-god, and the one under Anunit.) One theory holds that Agade was situated opposite Sippar on the left bank of the Euphrates, and was perhaps the oldest part of the city of Sippar. Another theory is that the ruins of Akkad are to be found beneath modern Baghdad. But despite numerous searches, the city has never been found. Reputedly it was destroyed by invading Gutians with the fall of the Akkadian Empire. 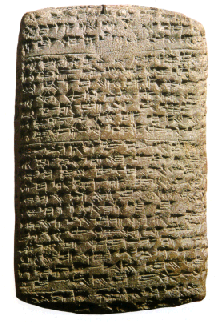 The first known mention of the city of Akkad is in an inscription of Enshakushanna of Uruk, where he claims to have defeated Agade - indicating that it was in existence well before the days of Sargon of Akkad, who the Sumerian kinglist claims to have built it. Akkad is mentioned once in the Tanakh - Book of Genesis 10:10: And the beginning of his (Nimrod's) kingdom was Babel, and Erech, and Accad, and Calneh, in the land of Shinar (KJV). The Greek (LXX) spelling is Archad. Semitic speakers seem to have already been present in Mesopotamia at the dawn of the historical record, and soon achieved preeminence with the first Dynasty of Kish and numerous localities to the north of Sumer - where rulers with Semitic names had already established themselves by ca. the 3rd millennium BC. One of these, contemporary with the last Sumerian ruler, Lugal-Zage-Si of Uruk, was Alusarsid (or Urumus) who "subdued Elam and Barahs (Barahsi? Parashi?)" thus beginning the trend towards regional empire. Sargon has often been cited as the first ruler of a combined empire of Akkad and Sumer, although more recently discovered data suggests there had been Sumerian expansions under previous kings, including Lugal-Anne-Mundu of Adab, Eannatum of Lagash, and Lugal-Zage-Si. The fame of the early establishers of Semitic supremacy was far eclipsed by that of Sargon of Akkad (Sharru-kin = "legitimate king", probably a title he took on gaining power) (23rd century BC), who defeated and captured Lugal-Zage-Si, conquering his empire. The earliest records in the Akkadian language all date to the time of Sargon. Sargon was claimed to be the son of La'ibum or Itti-Bel, a humble gardener, and possibly a hierodule, prostitute, or priestess to Ishtar or Inanna. One legend related of Sargon in neo-Assyrian times says that "My mother was a changeling (? ), my father I knew not. The brothers of my father loved the hills. My city is Azurpiranu (the wilderness herb fields), which is situated on the banks of the Euphrates. My changeling mother conceived me, in secret she bore me. She set me in a basket of rushes, with bitumen she sealed my lid. She cast me into the river which rose not over me. The river bore me up and carried me to Akki, the drawer of water. Akki, the drawer of water, took me as his son and reared me. Akki the drawer of water, appointed me as his gardener. While I was gardener Ishtar granted me her love, and for four and (fifty?) ... years I exercised kingship." He also boasted of having subjugated the "four quarters" - the lands surrounding Akkad to the north (Subartu), the south (Sumer), the east (Elam) and the west (Martu). Some of the earliest texts credit him with rebuilding the city of Babylon (Bab-ilu) in a new location. Troubles multiplied toward the end of his reign. A later Babylonian text states "In his old age, all the lands revolted against him, and they besieged him in Akkad (the city)" ... but "he went forth to battle and defeated them, he knocked them over and destroyed their vast army". Also shortly after, "the Subartu (mountainous tribes of) the upper country - in their turn attacked, but they submitted to his arms, and Sargon settled their habitations, and he smote them grievously". These difficulties broke out again in the reign of his sons. Revolts broke out during the 9-year reign of his son, Rimush, who fought hard to retain the empire - and in the fifteen year reign of Rimush's elder brother, Manishtushu. The latter king seems to have fought a sea battle against 32 kings who had gathered against him. Both appear to have been assassinated. The fall of the empire established by Sargon seems to have been as sudden as its rise, and little is known about the Gutian period. From the fall of Akkad ca. 2083 BC until the Sumerian renaissance ca. 2050 BC, there is much that is still dark. This collapse of rain-fed agriculture in "the Upper Country" meant the loss to southern Mesopotamia of the agrarian subsidies which had kept the Akkadian Empire solvent. Water levels within the Tigris and Euphrates fell 1.5 metres beneath the level of 2600 BC, and although they stabilised for a time during the following Ur III period, rivalries between pastoralists and farmers increased. Attempts were undertaken to prevent the former from herding their flocks in agricultural lands, such as the building of a 180 km wall between the Tigris and Euphrates under the neo-Sumerian ruler Shu=Sin. Such attempts led to increased political instability; meanwhile, severe depopulation occurred to re-establish demographic equilibrium with the less favorable climatic conditions. The period between ca. 2150 BC and 1940 BC is sometimes called the 3rd dynasty of Ur or "Sumerian Renaissance", founded by Ur-Namma (originally a general). Documents again began to be written in Sumerian, although Sumerian was becoming a purely literary or liturgical language, much as Latin later would be in Medieval Europe. Initially, the monarchical lugal (lu = man, gal = great) was subordinate to the priestly ensi, and was appointed at times of troubles, but by later dynastic times, it was the lugal who had emerged as the preeminent role, having his own "e" (= house) or "palace", independent from the temple establishment. By the time of Mesalim, whichever dynasty controlled the city of Kish was recognised as sar kissati (= king of Kish), and was considered preminent in Sumer, possibly because this was where the two rivers approached, and whoever controlled Kish ultimately controlled the irrigation systems of the other cities downstream. 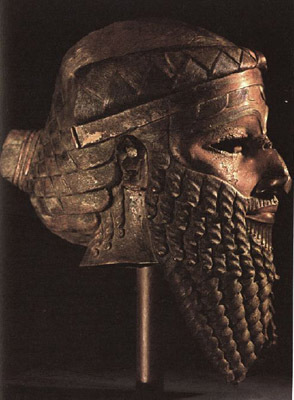 As Sargon extended his conquest from the "Lower Sea" (= Persian Gulf), to the "Upper Sea" (= Mediterranean), it was felt that he ruled "the totality of the lands under heaven", or "from sunrise to sunset", as contemporary texts put it. Under Sargon, the ensis generally retained their positions, but were seen more as provincial governors. The title sar kissati became recognised as meaning "lord of the universe". One strategy adopted by both Sargon and Naram-Sin, to maintain control of the country, was to install their daughters, Enheduanna and Enmenanna respectively, as high priestess to Sin, the Akkadian version of the Sumerian moon deity, Nanna, at Ur, in the extreme south of Sumer; to install sons as provincial ensi governors in strategic locations; and to marry their daughters to rulers of peripheral parts of the Empire (Urkush and Marhashe). With Naram-Sin, Sargon's grandson, this went further than with Sargon, with the king not only being called "Lord of the Four Quarters (of the Earth)", but also elevated to the ranks of the dingir (gods), with his own temple establishment. Previously a ruler could, like Gilgamesh, become divine after death but the Akkadian kings, from Naram-Sin onward, were considered gods on earth in their lifetimes. Their portraits showed them of larger size than mere mortals and at some distance from their retainers. The population of Akkad, like all pre-modern states, was entirely dependent upon the agricultural systems of the region, that seem to have had two principal centres: the irrigated farmlands of southern Iraq that traditionally had a yield of 30 grains returned for each grain sown, making it more productive than modern farming; and the rain-fed agriculture of northern Iraq, known as "the Upper Country". Southern Iraq during Akkadian period seems to have been approaching its modern rainfall level of less than 20 mm per year, with the result that agriculture was totally dependent upon irrigation. 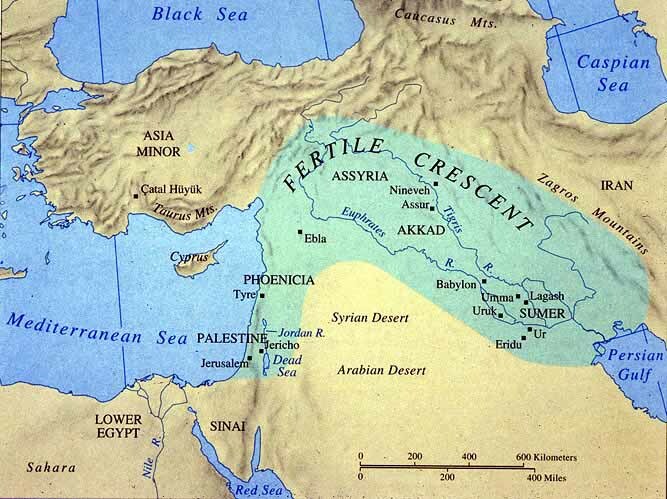 Prior to the Akkadian period the progressive salinisation of the soils, produced by poorly drained irrigation, had been reducing yields of wheat in the southern part of the country, leading to the conversion to more salt-tolerant barley growing. Urban populations there had peaked already by 2,600 BC, and ecological pressures were high, contributing to the rise of militarism apparent immediately prior to the Akkadian period (as seen in the stele of the vultures of Eannatum). Warfare between city states had led to a population decline, from which Akkad provided a temporary respite. It was this high degree of agricultural productivity in the south that enabled the growth of the highest population densities in the world at this time, giving Akkad its military advantage. The water table in this region was very high, and replenished regularly - by winter storms in the headwaters of the Tigris and Euphrates from October to March, and from snow-melt from March to July. Flood levels, that had been stable from about 3,000 to 2,600 BC, had started falling, and by the Akkadian period were a half-meter to a meter lower than recorded previously. Even so, the flat country and weather uncertainties made flooding much more unpredictable than in the case of the Nile; serious deluges seem to have been a regular occurrence, requiring constant maintenance of irrigation ditches and drainage systems. Farmers were recruited into regiments for this work from August to October - a period of food shortage - under the control of city temple authorities, thus acting as a form of unemployment relief. Some[who?] have suggested that this was Sargon's original employment for the king of Kish, giving him experience in effectively organising large groups of men; a tablet reads, "Sargon, the king, to whom Enlil permitted no rival - 5,400 warriors ate bread daily before him". Harvest was in the late spring and during the dry summer months. Nomadic Martu (Amorites) from the northwest would pasture their flocks of sheep and goats to graze on the stubble and be watered from the river and irrigation canals. For this privilege, they would have to pay a tax in wool, meat, milk, and cheese to the temples, who would distribute these products to the bureaucracy and priesthood. In good years, all would go well, but in bad years, wild winter pastures would be in short supply, nomads would seek to pasture their flocks in the grain fields, and conflicts with farmers would result. It would appear that the subsidizing of southern populations by the import of wheat from the north of the Empire temporarily overcame this problem, and it seems to have allowed economic recovery and a growing population within this region. As a result, Sumer and Akkad had a surplus of agricultural products, but was short of almost everything else, particularly metal ores, timber and building stone, all of which had to be imported. The spread of the Akkadian state as far as the "silver mountain", the "cedars" of Lebanon, and the copper deposits of Magan (modern Oman), was largely motivated by the goal of securing control over these imports. One tablet reads "Sargon, the king of Kish, triumphed in thirty-four battles (over the cities) up to the edge of the sea (and) destroyed their walls. He made the ships from Meluhha (the Indus civilization), the ships from Magan (and) the ships from Dilmun (Bahrein) tie up alongside the quay of Agade. Sargon the king prostrated himself before (the god) Dagan (and) made supplication to him; (and) he (Dagan) gave him the upper land, namely Mari, Yarmuti, (and) Ebla, up to the Cedar Forest (and) up to the Silver Mountain". The location of the "Silver Mountain" is uncertain, but it is believed to have been in the Taurus Mountains, in southern Anatolia.] Inscriptions from much later tell of a campaign as far as Purushkanda, believed to have been on one of the tributaries of Lake Beysehir. The same inscription tells of securing the trade from Kaptara, believed to be the Akkadian name for the location known to Egyptians as Keftiu, probably either Cyprus or the Minoan civilisation of Crete, or both. This concern with trade may also have led the Akkadian forces to attack Byblos, denying Ancient Egypt the cedars of Lebanon in the latter part of the Egyptian 6th Dynasty. This is an important chronological correspondence between the two civilizations. Akkadian scribes wrote the language using cuneiform script, an earlier writing system devised by the Sumerians using wedge-shaped signs pressed in wet clay that in Akkadian could represent either (a) Sumerian logograms (i.e. picture-based characters as in Chinese), (b) Sumerian syllables, (c) Akkadian syllables, and (d) phonetic complements. Cuneiform was in many ways unsuited to Akkadian: among its flaws was its inability to represent important phonemes in Semitic, including a glottal stop, pharyngeals, and emphatic consonants. In addition, cuneiform was a syllabary writing system - i.e. a consonant plus vowel comprised one writing unit - frequently inappropriate for a Semitic language made up of triconsonantal roots (i.e. three consonants minus any vowels). Older Sumerian cuneiform also distinguished between the vowels i and e; this distinction, though not originally present in Akkadian, was adopted by scribes to compensate for the disappearance (or non-writing) of the original Semitic pharyngeals. Sumerian written literature achieved an extremely high degree of excellence in the Akkadian period, principally in the work and example of Enheduanna. Enheduanna, the "wife (Sumerian "dam" = high priestess) of Nanna [the Sumerian moon god and daughter of Sargon] of the temple of Sin at Ur, who lived ca. 2285-2250 BC, is the first poet in history whom we know by name. Her known works include hymns to the goddess Inanna, the Exaltation of Inanna and In-nin sa-gur-ra. A third work, the Temple Hymns, a collection of specific hymns, addresses the sacred temples and their occupants, the deity to whom they were consecrated. The works of this poetess are significant, because although they start out using the third person, they shift to the first person voice of the poet herself, and they mark a significant development in the use of cuneiform. As poetess, princess, and priestess, she was a personality 'who set standards in all three of her roles for many succeeding centuries...', according to William W Hallo. A bas relief representing Naram-Sin, and bearing a striking resemblance to early Egyptian art in many of its features, has been found at Diyarbakir, in modern Turkey. Babylonian art, however, had already attained a high degree of excellence; two cylinder seals of the time of Sargon are among the most beautiful specimens of the gem-cutter's art ever discovered. One tablet from this period reads, "(From the earliest days) no-one had made a statue of lead, (but) Rimush king of Kish, had a statue of himself made of lead. It stood before Enlil; and it recited his (Rimush's) virtues to the idu of the gods". Akkadian artists also discovered the "lost wax" method of bronze casting, previously believed to have been discovered much later, at the time of classical Greece. The empire was bound together by roads, along which there was a regular postal service. Clay seals that took the place of stamps bear the names of Sargon and his son. A cadastral survey seems also to have been instituted, and one of the documents relating to it states that a certain Uru-Malik, whose name appears to indicate his Canaanite origin, was governor of the land of the Amorites, or Amurru as the semi-nomadic people of Syria and Canaan were called in Akkadian. It is probable that the first collection of astronomical observations and terrestrial omens was made for a library established by Sargon. The "limmu" calendrical system, used henceforth in Mesopotamian history, whereby which years were named by one significant event, and these were listed, also began in the Akkadian period.